Custom Clipboards Personalized in Bulk. 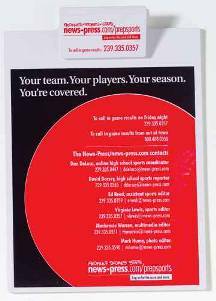 Promotional, Inexpensive. Budget Prices in USA and Canada. Black, Blue, Granite, Green, Red, White, Yellow . Sturdy bulk custom imprinted clipboards, personalized on clip or board for promotional use. Budget Prices in USA and Canada for customized clipboards. Our low cost wholesale personalized clipboards are available with rush delivery: see the price table. Free artwork design. We will send you a proof for your approval before production . 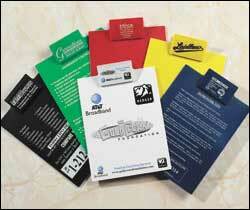 Prices include your one color custom imprint on clip. See the price list below for the additional cost of extra imprint colors on either the clip or the entire board. Setup Charge: $40.00 per color, per location. Standard Production: 7 working days; see above the more expensive prices for 3-day production. Option: Calculator Clipboards . Our clipboards are also available with an 8-digit solar calculator permanently affixed to the clip. Add only $1.75 per clipboard. Price includes 1-color imprint on board. Full-sized clipboard with a 4" clip holds a standard 8 1/2" x 11" writing pad. Custom Imprinted on the clip and/or on the board. Product Size: 9 1/8" x 13"
Clip Size: 2 3/8" x 4"
Clip Imprint Area: 1 5/8" x 3 1/2"
Front Board Imprint Area:10" x 8 5/8"
Back Board Imprint Area: 11 1/2" x 8 5/8"